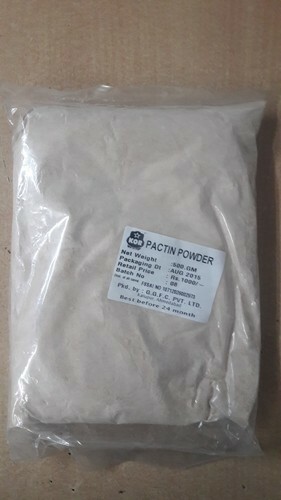 Pectin Powder is a structural heteropolysaccharide contained in the primary cell walls of terrestrial plants. It is produced commercially as a white to light brown powder, mainly extracted from citrus fruits, and is used in food as a gelling agent particularly in jams and jellies. It is also used in fillings, medicines, sweets, as a stabilizer in fruit juices and milk drinks, and as a source of dietary fiber. Established in the year 2003, we, “Gujarat General Food Chem Private Limited”, are engaged in manufacturing, trading and supplying a comprehensive range of Chinese & Dessert Food Products, Ice Cream Raw Material, Snacks Topping Foods and Food Chemical Products. In addition to this, we trade and supply Food Colour and Chocolate & Bakery Products. Our complete range encompasses Hakka Noodles, Stick Noodles, Green Chilli Sauces, Red Chilli Sauces, Soya Sauce, Vinegar, Cornflour, Ice Cream Raw Material, Snacks Topping Sauces and Tomato Ketchup. Moreover, we offer Mixed Fruit Jam, Custard Powder, Milk Jelly, Food Colour & Essence, Food Colours, Food Chemicals, Milk Choco Slab, Cocoa Butter, Bread Improver and Egg Free Cake Concentrate. The entire range of products offered by us is appreciated for high shelf life, hygienic processing & packaging and availability in packs of various quantities. Owing to the quality of our products, these find widespread application in the food processing industry, restaurants, hotels and residences, among others. We are looking query majorly from Gujarat.